The Napoleon NZ7000 Wood Fireplace takes on the European style with its clean linear look and large viewing area. This new fireplace in the Napoleon’s High Country Series features an exclusive counterbalanced ZERO GRAVITY™ door system. The Napoleon High Country 7000 has a unique door system that operates the screen and heat radiating ceramic glass independently. This allows the fire to be viewed through either the glass, screen or both. 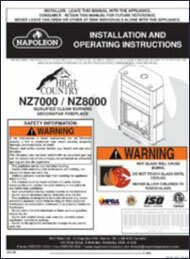 The Napoleon NZ7000 has a large firebox capable of holding up to 50 pounds of wood. The Napoleon High Country 7000 Wood Fireplace also has a powerful air wash system that keeps the glass clean. The super-boost air induction ports on this wood fireplace sweep across the ember bed for extremely fast start-ups. The Napoleon NZ7000 Wood Fireplace is one of the cleanest wood burning fireplaces available today!